This is what I call the F-major small shape. It's got all the right notes at all the right places. And in ascending order. F - A - C - F.
This shape is more difficult than other open chord shapes because you have to use your index finger to press down on two strings at the same time. It's a great prerequisite to the barred chords later on. 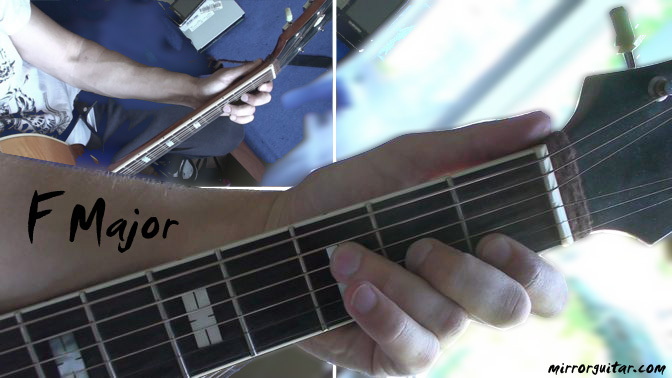 Important: your fingers are making a slight angle to the fretboard. Your hand and forearm are relaxed. When I thought my students this new chord I always said: It's not right at this time. And you don't have to worry about it. Just practice, as long as you KNOW that right now, you still need to perfect it. That's so with everything. If you are unaware of your shortcomings than you'll never grow. You can read all about proper guitar form at the On Injury page. Left: Not so good. Right: Good relaxed technique. Here's a one-two-three on grabbing this chord.. If you're practicing the guitar for yourself, try out this chord sequence. Am-C-G-F and let me know how you progress. For everyone else, be prepared for a full song with harmonica accompanied very soon! 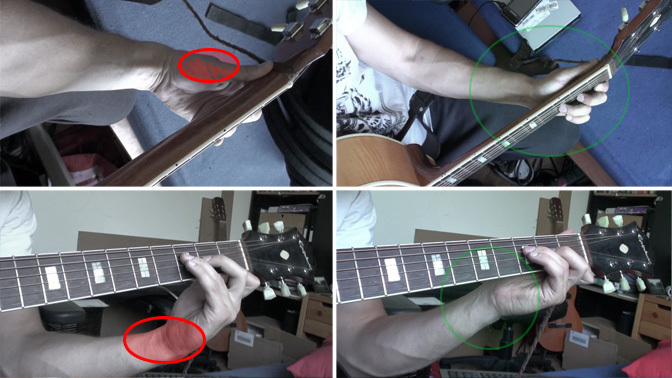 Thansk for the tutorial, nice pictures I'm trying to learn how to play the guitar at the moment this is very helpful. F the chord of the devil. A chord that still annoys me. I like how you illustrated the proper techniques for holding the guitar. The red makes it seem extra painful! I vividly remember the F chord being that hardest to hit when I started playing guitar almost ten years ago. It was hard for me to bar my index finger while still hitting the other notes. The only hard part about it is covering both the B and e strings on the first fret. @Jay Reid, thanks for confirming. I appreciate it. Even with an animation! you really make a good work. Would love to be able to play ! I've been trying to play guitar but it's so uncomfortable because of how I was placing my fingers and positioning my hands. These pictures are really helpful!